The Rockefeller Republicans, otherwise called Liberal Republicans, were members of the Republican Party in the 1940s–1970s who held moderate to liberal views on domestic issues, similar to those of Nelson Rockefeller, Governor of New York and Vice President of the United States . Rockefeller Republicanism has been described as the last phase of the "Eastern Establishment" of the GOP, which had been led by New York governor Thomas E. Dewey. The group's powerful role in the GOP came under heavy attack in 1964 and it lost most of its influence. At a discouraging point in the 1964 primary campaign against Barry Goldwater in California, political operative Stuart Spencer called on Rockefeller to "summon that fabled nexus of money, influence, and condescension known as the Eastern Establishment. 'You are looking at it, buddy,' Rockefeller told Spencer. 'I am all that is left.'" 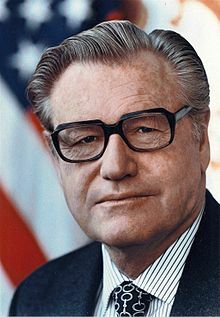 Nelson Rockefeller, after whom Rockefeller Republicans are named. The Rockefeller Republicans, otherwise called Liberal Republicans, were members of the Republican Party (GOP) in the 1940s–1970s who held moderate to liberal views on domestic issues, similar to those of Nelson Rockefeller, Governor of New York (1959–1973) and Vice President of the United States (1974–1977). Rockefeller Republicanism has been described as the last phase of the "Eastern Establishment" of the GOP, which had been led by New York governor Thomas E. Dewey. The group's powerful role in the GOP came under heavy attack in 1964 and it lost most of its influence. At a discouraging point in the 1964 primary campaign against Barry Goldwater in California, political operative Stuart Spencer called on Rockefeller to "summon that fabled nexus of money, influence, and condescension known as the Eastern Establishment. 'You are looking at it, buddy,' Rockefeller told Spencer. 'I am all that is left.'"